Discover HoomanTV's Youtube and Instagram stats, most viewed videos and tag analysis. 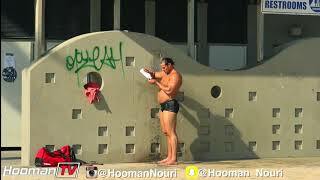 My name is Hooman Nouri. I am the creator of HoomanTV. I've dedicated my life since May 24 2014 for creating entertaining videos on YouTube! You can call me a crazy prankster , goofy and silly comedian or an evil joker but regardless watching my many funny videos are sure to give you a quick chuckle , giggle or will straight up make you laugh out loud ! Some of my funniest and most viral prank videos are my shampoo pranks , gold digger pranks , my picking up girl videos and a few videos of me pranking my own girlfriend ! If you are looking for something hysterical and entertaining that'll make you laugh and smile be sure to check these out! Hooman TV is a candid camera prank show based in Los Angeles , California ! I have a goofy , fun , funny , hysterical sense of humor and want nothing more to spread laughter , happiness and positivity in this world ! Grab yourself a drink , kick back and pick a few of my pranks to watch and allow the comedy and humor to entertain you for a little! Get inspired by discovering the TOP 100 Youtube videos of HoomanTV. Discover which video tags are used by HoomanTV for the most videos.